Chef Rosie O’Connor of Provecho Grill has hosted the first cannabis-infused culinary event in Menifee. Tacos and Tokes was a private event concerning the legalities of the herb. Since becoming recreationally legal this past January, marijuana has become quite popular in the kitchen. We have seen a rise in recreational use for good reason. The herb offers many health benefits that serve as an alternative to painkillers and other opioids many depend on. Tacos and Tokes, a great name combining the two featured items, food and cannabis, consisted of six different dishes with desert included. The dishes were heavily influenced by O’Connor’s culture and upbringing. Her background includes Japanese, Salvadoran, Mexican and Peruvian, and the dishes reflected each of those. Four different strains of cannabis were used. O’Connor told us that there were 35 guests in attendance and the response from each was nothing but gratitude. A featured dessert from Tacos and Tokes. O’Connor was inspired to put on such an event from High Times Harvest Cup finalist chef Manny Mendoza. Mendoza has since then started Herbal Notes, a California-based supper club that serves cannabis-infused meals. She explains that the new laws were a contributing factor of inspiration, but it wasn’t until she attended a dinner put on by Mendoza that she felt the time was right to organize her own event. “I thought to myself, this is the most incredible experience I have ever had,” said O’Connor. Many people are now consuming marijuana raw. Ingesting raw cannabis, meaning putting it into a smoothie or even eating it in a salad, does not actually cause the psychoactive side effects typically associated with the herb, and like any other leafy green plant, there are many nutrients packed into cannabis, like fiber, iron, calcium, vitamin C and some antioxidants. All of these are known to protect the body from certain maladies. The menu featuring the four different strains used. There are 421 distinct chemical compounds in the cannabis plant. The primary compound tetrahydrocannabinol (THC) has been shown to play an important role in pain regulation and inflammation. Another compound of the marijuana plant, Cannabidiol (CBD), which makes up about 40 percent of the plant’s extract, does not appear to have any psychoactive effects similar to those caused by THC. You might not be aware of how many restaurants and bars in your backyard are taking advantage of the new laws. West Hollywood’s Gracias Madre has been serving CBD since 2016. Pattern Bar, also in Los Angeles, serves several drinks featuring CBD. This trendy spot allows you to add cannabis to any drink for only $5. Prank Bar in downtown Los Angeles is also taking advantage of the compound and serves cocktails infused with terpenes. The legalities of cannabis are similar to alcohol. Only licensed shops are allowed to sell to individuals 21 and older with a valid identification card. The state prohibits consumption in public and you cannot drive under the influence. Lastly, a person is allowed to grow up to six marijuana plants per household as long as they are out of public view. It seems as if more people are accepting the potential of this plant and all the medical benefits it provides. As events like this raise awareness of the health benefits of cannabis among the public, the stigma of the drug and its association with stoners may finally begin to fade. 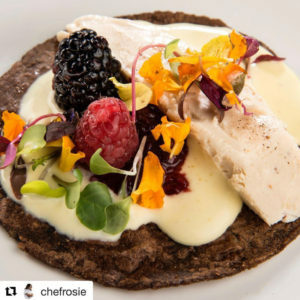 Keep your eye out for similar events on https://potguide.com/california/marijuana-events/event/2018-03-30/5-course-cannabis-infused-dinner-with-bb/.